Roach Queens are much smarter than the standard dungeon roach, as they concern themselves with spawning roach offspring rather than tasting the flesh of a delver. 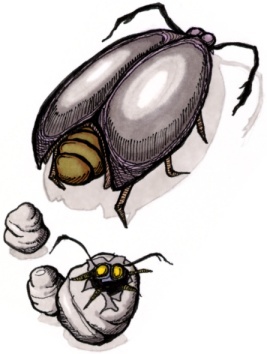 In fact, they will never eat an abovegrounder, but will instead run away as far as they can in order to increase the roach count in a room.Roach queen mentality is the exact opposite – rather than drawing a line towards you, they draw a line away from you and follow it until it impossible for them to move further. Every thirty turns, a roach queen will lay up to eight eggs in the spaces surrounding her. These offspring take five turns to mature into fully grown roaches. Always keep an eye out for the roach queen's offspring. Make sure that you are able to kill them safely and without retreat. Many times, there will be more roaches attacking than it is possible to kill between spawns. The important thing is to stay attacking while killing at least one roach per turn while gaining as much ground as possible. You will also need to watch out for the queen herself, as many architects have created devious rooms that involve smitemasters having to make sure the queen doesn't trap herself. Like roaches, roach queens determine which of the eight adjoining squares is closest to player but then attempt to move in the opposite direction. If blocked horizontally or vertically, she does nothing. If the move was diagonal, however, she will try to move vertically away and then horizontally away if that is blocked too. Every 30 turns, roach queens lay eggs on every blank square in each of the eight directions from her in the order of NW, N, NE, W, E, SW, S, SE (this is the order in which the roaches will hatch and move; they will be fully hatched on their fifth turn on the screen and move the turn after that). She cannot lay eggs on open yellow doors, scrolls, force arrows or trapdoors and, if she just moved from another tile in the last turn, she will not lay an egg on this tile. move diagonally vertically and towards the vertical line passing through the center of the room, and if the queen would have been told to move horizontally, it orders the queen to move diagonally horizontally and towards the horizontal line passing through the center of the room. The queen then tries to move in the direction suggested by the brain (this will always be diagonally); if it can't, then it tries to move in the closest vertical direction, and then it tries the closest horizontal direction.